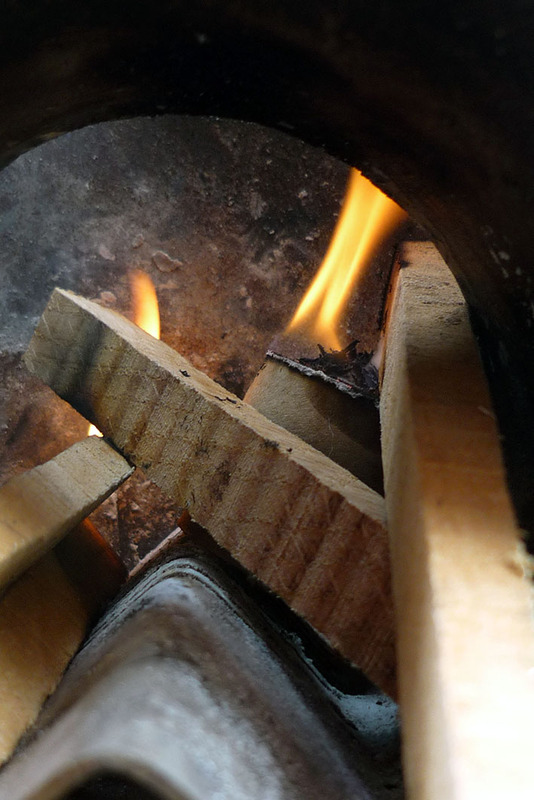 Here are the results I’m really pleased, they burn well and for a long time too! If the tube is very long cut it into loo roll sized lengths, my tube was very thick so I used a small saw making sure I held the tube firmly. It has a tendency to slip at the start so watch your fingers. I then closed one end of each of the tubes with some gummed paper roll, you could also use masking tape. Using a short piece of dowel I then stuffed each roll tightly with sawdust. At first I thought that I’d have to pack them loosely or the wax wouldn’t soak in but soon found it went in fine so then packed them as tightly as I could. I propped the tubes upright in the lid of an egg carton and slowly poured in the molten wax. I used an electric wax pot to melt the wax but it can be melted using a double boiler. Remember melting wax can easily catch fire so never leave it unattended or melt on the stove without using the double boiler. After leaving the tubes to cool down -they get quite hot with all the wax – I used the saw to trim them to 5cm pieces and poked in a piece of wooden skewer to act as a wick. One thing I did find is that they took a lot more wax than I first thought and I had to go hunting around to find more candles to fill them up. I suppose I could have just made less but I had the idea I wanted to get a good stock of them for coming season! Or if you have a birthday coming up or don’t want to DIY these Moose shaped natural firelighters from RE are a lovely alternative.